The Rise and Fall of Northern Goshawks in the Central Appalachian Mountains: Is There Reason for Conservation Concern in the Northeastern U.S.? Admired by people for its aggressiveness, courage, flight prowess and hunting ability long before the dark ages, in the northern hemisphere the Northern Goshawk is an ultimate avian forest predator. Hunters, fisherman, hikers and bird watchers consider it the meanest bird in the forest. With short wings and a long rudder-like tail, goshawks are superbly adapted for pursuing prey in a forest and they aggressively attack anyone who comes near their nest during the breeding season. 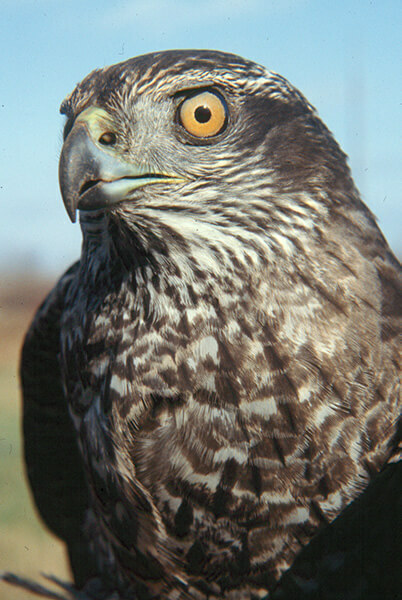 Northern Goshawks periodically undertake massive exoduses from their core breeding area in Canada. What makes these birds tick? Why are they important to us? Persecuted for years as a robber of game, over the past 50 years Northern Goshawks have expanded their breeding range and increased their population size in the northeastern U. S., including the central Appalachians. 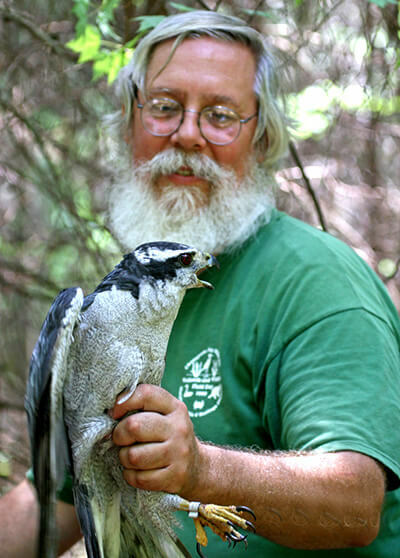 Since 1977, Dave Brinker has studied goshawks in both northeastern Wisconsin and the central Appalachian Mountains. Initiated in 1994, the Central Appalachian Goshawk Project has monitored over 100 goshawk nesting attempts, banded 63 nesting adults, and investigated winter movements of breeding adults from northwestern Pennsylvania down the Appalachian Mountains through the high country of West Virginia. Learn about the ecology and natural history of this fascinating inhabitant of the forest. Are goshawks still increasing in the Central Appalachians? Do breeding adults migrate? What drives the massive goshawk incursions from Canada and might we experience one in the near future? What is the conservation outlook for goshawk in the northeastern U.S.? Come find out! The Raptor Population Index recently issued new data on raptor population trends in North America through 2016. The recent 2017 NorthEast Hawk Watch Report, written by Trudy Battaly, contains some powerful insights into migration trends in the northeast, based on a very different set of migration data. This brief presentation summarizes migration trends in the northeast and population trends in North America based on these sources. 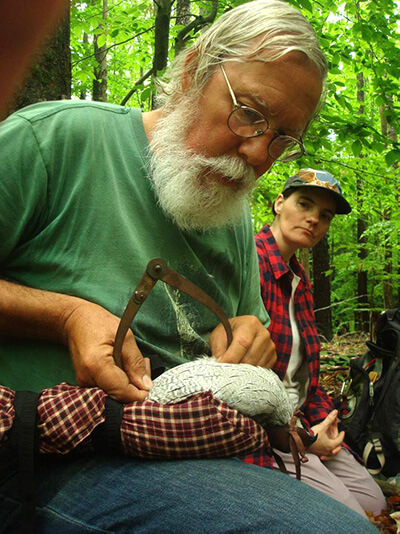 Dave Brinker has worked for the Maryland Department of Natural Resources since 1990, where he is currently a Regional Ecologist with the Natural Heritage Program working on biodiversity conservation. Professionally he works on colonial nesting waterbirds, obligate marsh nesting birds, freshwater mussels and odonates. He has a long history of interest in birds and raptor banding that started with bird banding in 1975 at the Little Suamico Ornithological Station, a raptor migration observation and banding station near Green Bay, Wisconsin where he observed his first Northern Goshawks. After moving east, in 1986 Dave started banding migrant Northern Saw-whet Owls at Finzel Swamp in the mountains of western Maryland and then in 1991 at Assateague Island. This interest evolved into Project Owlnet, a continent-wide collaborative network of migrant owl banding stations. Dave’s fascination with Northern Goshawks and wildlife cycles began in Wisconsin shortly after obtaining his B.S. from the University of Wisconsin-Green Bay in 1977. After moving east he continued working on goshawks nesting in the Monongahela National Forest in West Virginia. This passion grew into the Central Appalachian Goshawk Project that now monitors goshawk territory tenacity, survival, and reproductive success at nest sites in West Virginia, Maryland and the Alleghany National Forest in northwest Pennsylvania. Dave is also a founding co-director of Project SNOWstorm, a collaborative effort to better understand the wintering ecology of Snowy Owls. Our annual business meeting includes the vote for board members, information on fall sites, vendors, raffle prizes and refreshments! WOBURN ELKS LODGE, 295 WASHINGTON ST. WOBURN, MA. 01801. FROM THE NORTH: Take I-95 South (MA- 128 South) towards Waltham to exit 36 for Washington St. Woburn. (First exit southbound after Rte 93.) Remain in the right lane at all times as you exit and merge right immediately onto Mishawum Rd. (not well marked) for two blocks. Then turn right at the light onto Washington St, crossing back over Rte 95. The Elks Lodge is 0.7 mi on the left at #295 and just after Sal’s Pizza. FROM THE SOUTH: Travel I-93 North (Boston) and take exit 36 (Stoneham /Woburn). Turn left onto Montvale Ave, then right at the Speedway gas station to Washington St. The Elks Lodge is 1.1 miles on the right at #295 and next to Sal’s Pizza. FROM THE WEST: Take I-95 North (MA-128 North) toward Peabody. Take exit 36 toward Woburn/ Winchester. After traffic light, turn right onto Washington St (south). The Elks Lodge is 0.8 mi on the left at #295 and just after Sal’s Pizza. There is plenty of free parking behind the Elks Lodge. Additional free parking is available behind Sal’s Pizza in the mall next door (north).